Rainmaker Resources Ltd. ("Rainmaker") is pleased to announce positive results from the initial geochemical sampling program conducted on its Sarcobatus Flats property in Nevada. 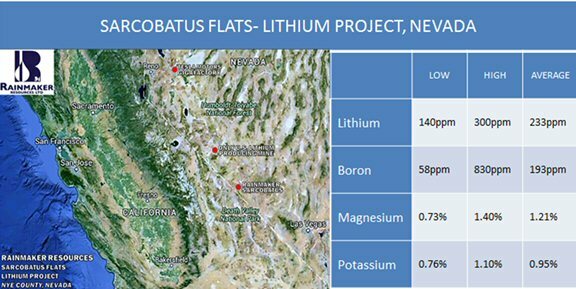 The samples yielded highly anomalous lithium contents - establishing the potential for Sarcobatus Flats to become a high-concentration lithium asset. Specifically, the analyses revealed lithium contents averaging 232 ppm (and up to 300 ppm), which compare favourably with other projects in the region. Rainmaker was also pleased to learn that the samples contained significant concentrations of boron (averaging 193 ppm). Chris M. Healey, P. Geo, President & CEO of Rainmaker, reported: "Substantial concentrations of lithium and boron in the clays below the surface salt pan are indicative of the presence of lithium-boron rich brines deeper in the geological column. With this confirmation, we can now plan to aggressively advance the property with geophysical surveying and the preparation of an NI 43-101 technical report. Fortunately, access to this flat and arid property is ideal as it lies directly adjacent to a major highway. These factors mean that exploration costs are expected to be low and environmental impact will be minimal." The lithium content of soils and vegetation in the Sarcobatus Flats property compare favourably with samples from nearby Clayton Valley - the only lithium-producing mine in the United States. As well, this area of Nevada has seen a rapid rise in exploration success. Highlighting the demand, a recent U.S. Geological Survey advised, "Lithium supply security has become a top priority for technology companies in the United States and Asia." This is especially relevant given the proximity of Tesla's new Nevada Gigafactory.